• Post-it® Super Sticky Notes have an enhanced adhesive which holds stronger and longer to vertical and difficult surfaces. 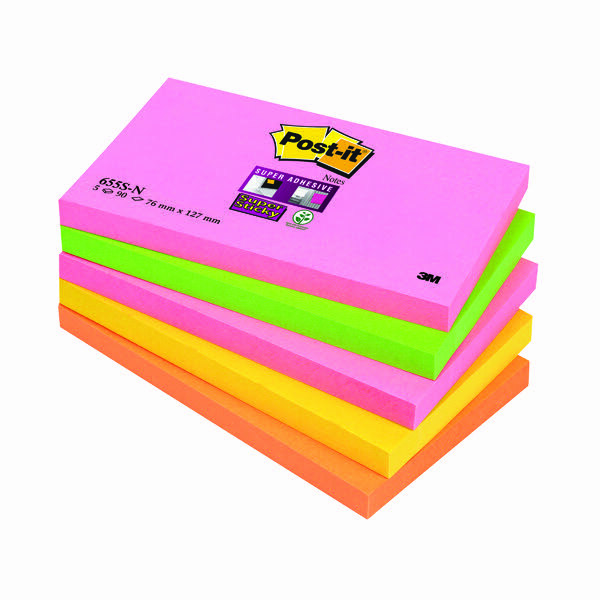 • Post-it® Super Sticky Notes stick to virtually any surface, and will remove cleanly following use. • Ideal for brainstorming and process mapping on meeting room walls and meeting charts. Ideal for desktop use, these repositionable Post-it Notes feature Super Sticky adhesive for strong, long lasting use. Perfect for making notes or leaving messages and reminders, each pad contains 90 sheets and measures 76 x 127mm. This pack contains 5 pads in Cape Town colours: neon pink, neon green, neon orange and yellow.